Farrar, Straus and Giroux (BYR), 9780374302467, 384pp. Piper and Sloane are best friends. They grew up together, dress alike, and never do anything without each other. To Sloane, Piper has always been extraordinary: fierce and pretty and powerful. The only thing that makes Sloane special is that Piper chose her for a sisterhood that was supposed to last forever. That is, until Piper caught Sloane kissing Piper’s boyfriend, Soup—and the next day, Piper is found dead, washed ashore on a beach. As Sloane and Soup relive their deep, sometimes painful histories with Piper and face a future without her, they are racked by questions: Who is to blame for Piper’s death? How do you make amends for hurting someone you love if that person is no longer around? And how can you ever move on and love again? 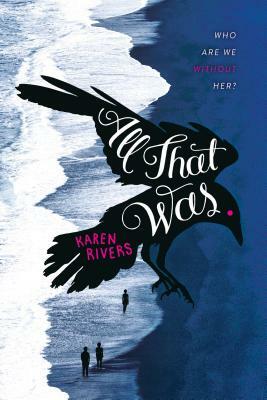 Told from alternating perspectives in Karen Rivers's signature lyrical prose, All That Was is a story about the complexity of friendships, forgiveness, and growing up. Karen Rivers is the author of many award-winning books for children and teens, including The Girl in the Well Is Me. She lives in Victoria, BC, with her children.